Discover the entire product range designed for the combined use with SNIPER System, that enable the immediate realization of avalanche blasting operations, ensuring the maximum safety for operators. SNIPER project is born as a solution for the needs of the different operators of the snow sector, in the field of Safety and avalanche Prevention. 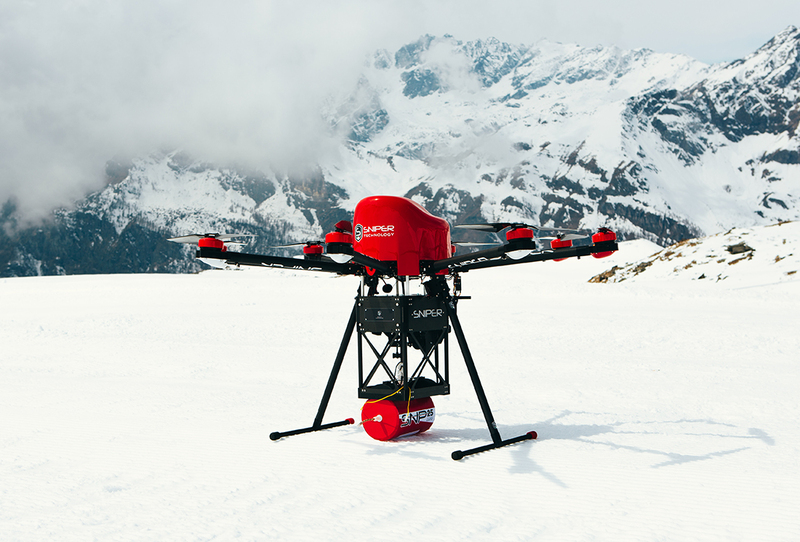 SNIPER System is an effective solution to the problem of blasting and securing of ski slopes and mountain roads from the avalanche danger, proposing itself as a system that combines the evolution of technologies in different fields like UAV and pyrotechnical explosives. Developed by our Team, composed by top experts in the sector at national level, SNIPER System revolutionises integrally the concept of Security in the snow world, generating considerable benefits with the primary aim of Prevention and human lives safeguard. SNIPER System and SNP explosive revolutionise the ways of intervention and ensure unprecedented levels of Security for the operators. The use of innovative technologies adds value to the image of the ski areas and Institutions that employ the System. These institution can also rely on training and support services. SNIPER System is a heap of cutting-edge technologies that ensures precision and intervention speed. The efficacy of SNIPER System is maximized during the combined use with the specific UAV that, provided with GPS System, positions itself independently in the precise predetermined blasting point. SNIPER System, attached to the exclusive UAV, allows the operators to enhance the critical areas from a ground station placed in a safe position. Moreover, the System is provided with a flight terminator system, the guarantees a totally safe flight. The speed of SNP explosive finding makes SNIPER System immediately usable by the operator. The blasting operation follows well-defined practices and if the operator combines the use of SNIPER System with the Drone, he only has to monitor the mission. Compared to the conventional methods in use, SNIPER System, the specific UAV and SNP explosive ensure a clear reduction of time and costs of intervention: the economical return for people who use them is immediate. SNIPER technology functions with zero emissions and does not require the building of permanent structure that can spoil the landscape. Moreover the packaging of SNP explosive is totally biodegradable. 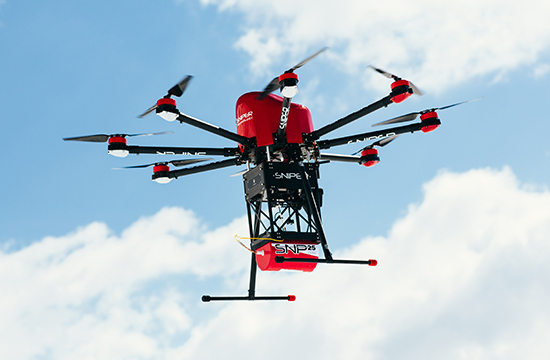 SNIPER System, attached to the Drone proposed by Atm Srl, designed appositely to guarantee optimal performances inside the complex mountain environment, allows the customers to perform an immediate intervention, like shown in the video. Codified and certified procedures allow people to conduct the operation in a totally safe way, cleaning the areas prone to avalanche risk and safeguarding firstly human lives and, as a consequence, structures and machineries. Who can use SNIPER System?